TAMPA, Fla. (AP) — Tampa Bay’s best start in eight years has dissolved into a .500 record that raises more questions than it answers about whether this finally will be the year the Buccaneers end their long playoff drought. The Bucs (2-2) weathered Jameis Winston’s suspension for violating the NFL’s personal conduct policy better than reasonably could have been expected, thanks to Ryan Fitzpatrick becoming the first player in league history to top 400 yards passing in three consecutive games. A porous defense, however, is threatening to undermine a season that looked so promising after Fitzpatrick led the team to wins over New Orleans and Super Bowl champion Philadelphia to start the season. 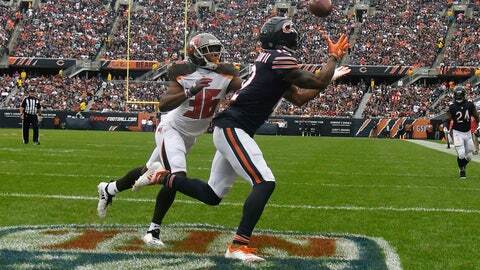 Last Sunday’s 48-10 loss to the Chicago Bears sent the Bucs into their bye week amid questions about whether coach Dirk Koetter might fire defensive coordinator Mike Smith during a break that couldn’t arrive soon enough. Despite being throttled by a Bears defense led by Khalil Mack. Tampa Bay has the NFL’s top-ranked passing attack and is No. 3 in total offense. The flip side is the Bucs have allowed a league-high 139 points through four games and have given up more yardage than every team except the Kansas City Chiefs, who are 4-0 despite their shortcomings on defense. “We’ve got to own it and we have to fix it,” coach Dirk Koetter said in the wake of what the coach described as a “horrific” performance against the Bears. Koetter is adamant, though, that firing Smith, the former Atlanta Falcons head coach, is not the answer. Not even after the Bucs were shredded by Chicago’s Mitchell Trubisky, the No. 2 pick in the 2017 draft, for 354 yards passing and six touchdowns. Since firing former coach Lovie Smith after the 2015 season, in part because Tampa Bay was having problems stopping opponents, the Bucs have invested heavily in the defense through free agency and the draft. Injuries have tested depth on the defensive line, as well as in a secondary missing cornerback Vernon Hargreaves III and safety Chris Conte. The absence of a consistent running game, capable of keeping opposing quarterbacks on the sideline for extended stretches, has hurt, too, considering the Bucs faced Drew Brees, Nick Foles and Ben Roethlisberger in the first three games. Lovie Smith was let go after a season in which the Bucs finished 10th in total defense, allowing 340.4 yards per game. Through the first month of the season, the current Bucs are allowing 358 yards per game through the air, 445.8 yards overall. Opposing quarterbacks completed 70 percent of their passes in 2015. It’s 77.1 percent after four games this year. Koetter has a longtime relationship with Smith. They worked together as assistants under Jack Del Rio in Jacksonville, and Smith later hired Koetter as his offensive coordinator when Smith became the head coach in Atlanta. “First, let’s get one thing straight. It has zero to do with relationships, OK? None of this is about relationships,” Koetter said. One change that is occurring, though, is Winston regaining the starting quarterback job. He sat out the first three games while serving his suspension and replaced Fitzpatrick in the second half against Chicago with the Bucs trailing 38-3. “Fitz’s combination of experience, talent and leadership is valued at a very high level here,” Koetter said in announcing the decision to bench the 35-year-old journeyman backup and play the No. 1 overall pick from the 2015 draft. The Bucs return to action on Oct. 14 at Atlanta.